I don't recall who said this… and I'm paraphrasing… but I absolutely loved it when I heard it and it's stuck with me ever since. "Why shouldn't we try to pick tops and bottoms? That's where the risk is smallest and the profit potential is greatest." So yes… I try to pick tops and bottoms. And that freaks some people out. I know… they send me emails. And they're not always nice! But the fact remains… the tops and bottoms are definitely where the risk is smallest and the profit potential is greatest. Someone is trading in those areas, selling at the tops and buying at the bottoms. If it's not the retail trader, who typically waits for confirmation, then perhaps it's the professional. Maybe you should be ask yourself how you can see what they're seeing? Last week we re-explored the concept of confirmation being risk. 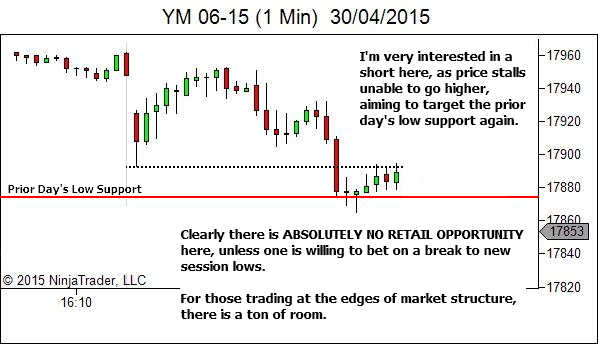 Real opportunity is found as close to the edges of the market structure as you can get. Where the risk is smallest and the profit potential is greatest. Is it easy? No. It requires greater skill at reading the sentiment within the price movement. But is it worth exploring as a means to improving your edge? Absolutely! As mentioned at the end of that article, this session went on to provide some further, very similar, opportunity. So let's explore them today. Now, it doesn't always work out. If I'm wrong, the loss is small. If I'm partially right and price moves only as far as the retail entry, I will usually be able to still work a small profit, whereas the retail entry would have led to a loss. 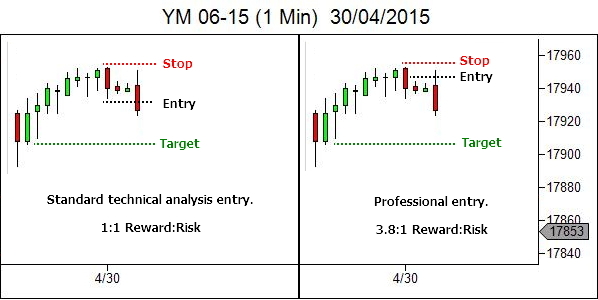 But when I'm right, the trade gives a much improved R:R when compared with the standard retail entry. In my experience, waiting for confirmation rarely provides a greater probability trade. But it always provides a worse reward:risk opportunity. Very informative and thank you so much for this article. Agreed, great part 2 to the article last week. Catching these entries is a work in progress, but an enjoyable one. The thing I like about high R:R trades is it really doesn’t matter what the probabilities are. With a 1:1, you need > 50% success (not including commissions) to break even. So even if I take breakout trades, which work for me about 48% of the time with aggressive management, it’s all good as my profit factor is > 2. I believe that quote is from Paul Tudor Jones. Attached is a link of PTJ quotes. Look at #13. I have seen this elsewhere as well. Thanks. That could be it. I have read that one before. To be honest though I’m not 100% sure. I do recall it being almost word for word as I’ve written. But perhaps that was someone else paraphrasing Paul Tudor Jones. Either way… I encourage everyone else reading this comment to look at Michael’s link. And especially comment #13. In order to simplify my trading I only trade using the ONE time frame. 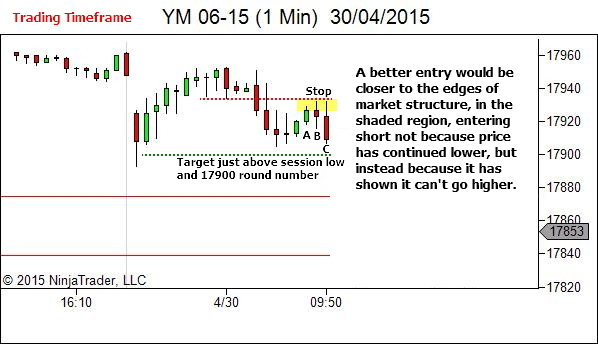 In the above example you use a lower time frame to refine your entries. But what happens if you were just using the 1 min time frame? Do you think you would be just as effective using this approach … or would you have to modify how and where you were looking to enter. Thanks. All entry decisions are made on the TTF. 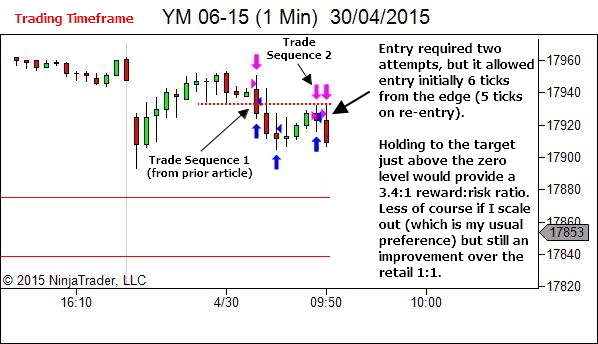 The LTF is used to “fine-tune” that analysis and time the entry/exit. For me, the LTF is necessary, but that’s just because it’s the way I’ve always done it. 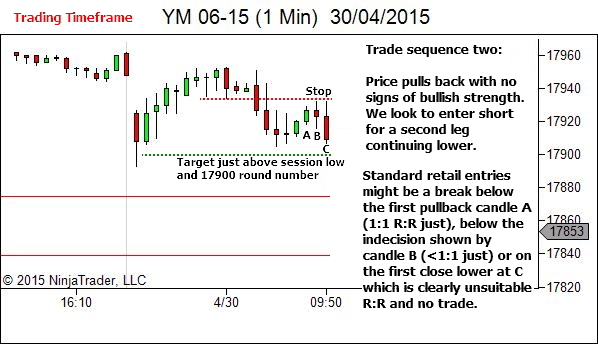 There is no reason though why the same principles could not be applied on one timeframe. The market, after all, does not really have timeframes. Price moves. We just choose to view that movement through different time-filters. It’s us that creates the timeframes, not the market. So the same method can be used just on one timeframe. 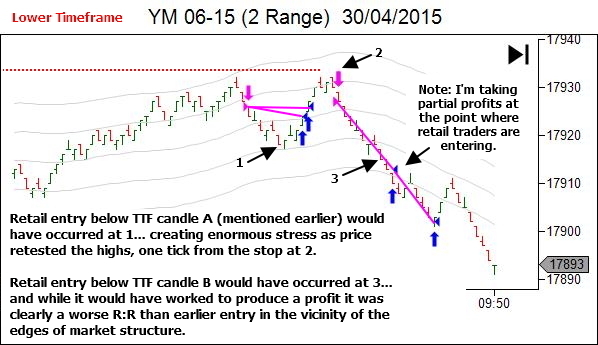 That timeframe defines the “areas in which you’re interested in trading”, exactly as my TTF does. The difference now is that you’ll need to feel the weakness within that one timeframe, instead of having the ability to refer to the great detail of the LTF. Sometimes it might be obvious in the candles. Other times it won’t at all. Often I imagine it will ONLY be evident if you watched as the candle develops (so fine if you’re trading 1 min charts, but not an option if you’re using 4H charts, for example). Depending upon the market you trade you may be able to refer to something like market internals, in order to get another non-price base indication of strength or weakness, to support your assessment of price strength/weakness. The principle is simply that we’re buying when we see that the sellers have given all they’ve got and run out of strength. Vice versa for selling. If you can see that within the single timeframe, then you can enter via this method. If you can’t see it, no trade. Ability to sense this weakness will improve as skill levels increase. This will make it harder initially. But certainly it’s possible. Is it possible to apply your method on daily chart? If yes do you prefer that?. 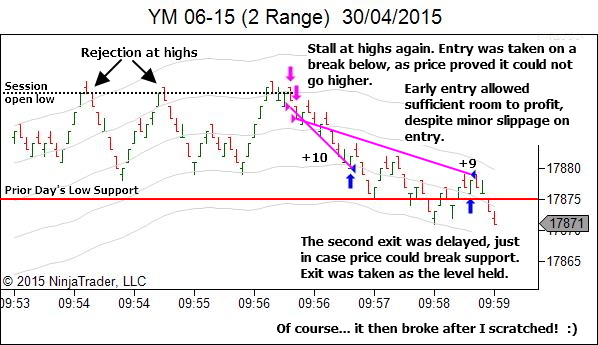 Are you referring to the entry method discussed in this article, or the YTC Price Action Trader? I’ll assume the former, since you’ve commented on this article. If it’s the latter, please email me. The entry method is simply an application of the principle of “buying when the sellers have exhausted themselves” and “selling when the buyers have exhausted themselves”. 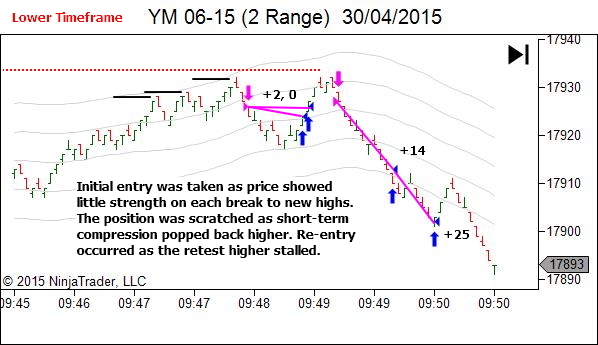 Yes, absolutely this can be applied on the daily chart. The challenge though is seeing the bulls or bears run out of strength, as it will often occur within the daily candles. This is where a lower timeframe can really help. But even then you miss out on some of the edge that a lower timeframe daytrader has, in that they sit through each candle and can “feel” the strength or weakness within the price movement. So there are some challenges. 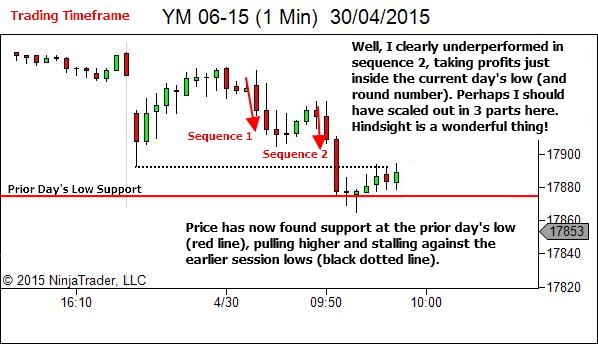 But absolutely yes… this entry method does apply to daily charts. Do I prefer that? Absolutely not. I’m a daytrader. does that mean watching say a 1 min candle play out on a 1 min timeframe as it goes back and forth between a low/mid/high close? or is it rather watching the 1 min candle play out on a 30 sec timeframe? I was not referring to any particular timeframe. Rather the ability to sit and watch the continuous flow of price. ie. screen-watching. I believe you would have received a lot of appreciation, but I just want to wholeheartedly appreciate your work. You are excellent. I’m glad you’re finding value in my writing.